This is a First World War novel with a difference. Anyone who has studied battalion war diaries will know that they can be light on detail and devoid of sentimentality. This novel takes the dry, clinical war diary entries and turns them into a story about the men. The approach taken is an interesting one; each chapter starts with a supposed extract from the war diary of a fictional New Army battalion, the 19th King’s Own Lancashire Rifles, from their embarkation in September 1915 through to a disastrous attack at the end of January 1916. The chapter then develops into a narrative of the events described in the war diary. The book has obviously been researched and the detail does shine through; you could be mistaken for thinking you were reading a fictional account of an actual battalion’s war diary. As well as recounting the experiences of the battalion in action, the minutiae and banality of trench life are also covered. Focusing the story on a battalion brings its own inherent problems. With such a large number of potential characters, people come and go with the blink of eye – but maybe that was the point. The characters themselves are in some cases overtly stereotypical, from the salt of the earth private to the rough and ready NCO; the ‘bad boy’ of the battalion, and the bumbling and pompous Commanding Officer. The narrative is set up by a modern day introduction whereby a man finds the war diary in a charity shop. It ends with an epilogue in similar vein, where the character reflects on the contents of the diary and meets a descendant of one of the men who features in it. Much of this epilogue is spent proselytizing about the futility of the war – not surprising given the title of the book but it is clunky and does not sit well with the rest of the narrative. In many ways the events of the war do not need fictionalising; there are plenty of true stories out there that deserve to be told. Yet I can see why the author took the approach that he did. Fictionalising an actual war diary would have projected actions and thoughts on people who did exist. Novels about the war come in for a lot of criticism, even the popular ones such as Birdsong. 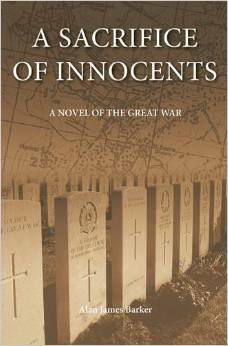 This isn’t in the same league, and of course no story can portray the reality of the war as it really was, experienced by those who were there, but treated as it should be read – fiction – ‘A Sacrifice of Innocents’ does a passable job of transporting the reader to the trenches.